The Syrp Slingshot 3-Axis 328' Motion-Controlled Cable Cam Time-Lapse Kit 1 from B&H allows you to capture smooth, motion-controlled, 3-axis time-lapse shots over 328' of distance. The kit features the Slingshot cable cam system with 328' ropes, the Genie II Linear motion control tracking motor, and the Genie II Pan/Tilt motor. A companion iOS/Android app allows you to set up and control all three axes. The Genie II Linear is an upgraded version of the original Genie tracking motor. It has a more compact and efficient design. 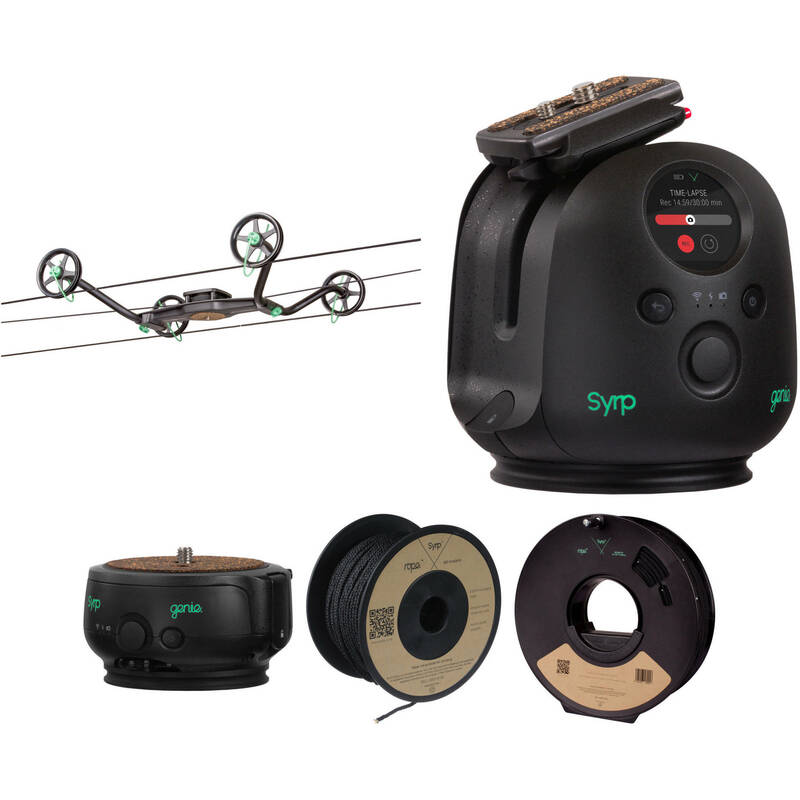 The Syrp Slingshot is designed to take motion control capture to the next level. Whereas motion control is normally limited to the length of your slider, the Slingshot allows you to achieve motion control for distances up to 328 ft. Moreover, it can be used high above the ground, so you can capture vast nature and city landscapes. You'll just need the motion control device itself in addition—either the Syrp Genie, Genie Mini, or multiples of these, all sold separately. Capture high production value shots in stadiums, parks, metropolitan areas, and pretty much anywhere else. Simply secure one mounting bar to a tree, light post, or something similar, and likewise fix the second bar a distance away. Install the included ropes between the two bars and then just place the Slingshot on top on its wheels. This could be done as low as near ground level or way up in the air. Everything, including the bars, sets up in just minutes, as all the components are designed to secure by a quick release ratchet mechanism. Even securing the bars to a tree or post requires no special effort. The optional Genie attaches on top of the Slingshot, and your camera goes on the bottom via a ball head (not included). The Genie provides tracking movement and allows you to capture real-time footage as well as time-lapse video. It's the Genie that's capable of operating at a max distance up to 328 ft. The Slingshot comes with 82 ft ropes for the Slingshot and the Genie, but you can get optional Syrp ropes up to 328 ft for both. You can also combine the Genie and Genie Mini together, or the Genie with two Genie Minis, to achieve up to full three-axis capture—tracking, panning, and tilting—at the same time. Furthermore, the Genies can be controlled using an iOS or Android app. When combining a Genie with two Genie Minis, a sync cable and pan/tilt bracket are also required. You may want to check out the B&H Slingshot kits that offer all these packaged together. The Slingshot is designed to be portable. Its components quickly and easily come apart from one another and neatly pack away into a custom designed backpack with pockets for each piece. Add the Syrp Genie II Linear to your slider along with the included Genie rope, and you can enjoy motorized sliding for precise tracking shots and dynamic time-lapse sequences. The versatile Genie II is also compatible with nearly any third-party slider. Features include reduced friction on the rope drive, a quick release camera plate for easy setup, keyframing with the Genie 2 app; and joystick, smartphone, and tablet control. Quiet operation and a compact portable design enable you to use the Genie II Linear almost anywhere your travel. Attach the main unit to your slider's platform, and once the included Genie rope is threaded properly, the Genie II linear can automatically slide along the length of the rope. A smartphone connected via Bluetooth can control the Genie II Linear wirelessly, and when used with the Genie II Motorized Pan/Tilt Head, you can access 3 axes of motion to accomplish more advanced shots. Future app features will include Bulb Ramping for day-to-night time-lapse exposure, HDR Timelapse, Simple Setup, Live View, 360° Time-Lapse, Multi-Row Panorama, and more. Create sliding shots and time-lapses with dynamic pan and tilt movements using the Syrp Genie II Motorized Pan/Tilt Head. Set up basic shots using head's built-in software or create complex moves with keyframes and more using the redesigned control app on your smartphone. Joystick control is featured on both the head and the app, enabling you to easily set start and end points. Utilizing the full 180° of tilt, the Genie II head can support up to 7.9 pounds, and up to 12.3 pounds if only the middle 90° are being used. Weighing just three pounds, this lightweight head is designed for portability. It snaps easily into the separately available Genie II Linear's integrated quick release system to create a 3-axis motion control head for your slider. Interface features include Bluetooth 4.2 Low Energy, 2.4 GHz Wi-Fi, and a color LCD display window. A USB-C cable adapter is included for plugging in your camera for app-controlled shutter release and a quick release plate is included for securing your camera. A future app update will include functions like Bulb Ramping for day-to-night time-lapse exposure, Simple Setup, Live View, 360° Time-Lapse, Multi-Row Panorama, and more. Note: Includes one USB-C to 2.5mm cable; select cameras may require a separately available Shutter Link Cable for shutter control. The Syrp Slingshot Rope is a braided rope with a UHMWPE core and polyester sheath that does not stretch or crush and remains uniform under tension. It comes on a reel for transport and storage. This item consists of two lengths of rope per reel, with each length being 328' long. This allows your Slingshot (not included) to travel the full length of the reel. Box Dimensions (LxWxH) 23.1 x 15.5 x 6.6"
Box Dimensions (LxWxH) 6.8 x 5.8 x 5.8"
Box Dimensions (LxWxH) 8.8 x 5.8 x 5.8"
Box Dimensions (LxWxH) 5.9 x 5.9 x 3.4"
Box Dimensions (LxWxH) 14.2 x 13.9 x 4.25"